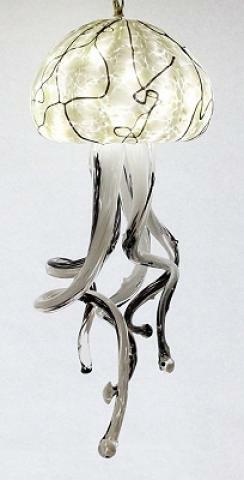 Magnificent Jellyfish Chandelier Lamp. This swag style chandelier is suspended by a generous 12' chained cord that can easily be mounted on a ceiling hook. Six independently swinging tentacles surround a 60 watt led bulb. Dimensions are approximately 24" high x 9" wide. Plug is wired for 110v. All pieces typically ship in 2 to 3 weeks. If time is essential, please contact us and we will be happy to let you know what is available for immediate shipment. Each piece is individually handmade and may vary slightly in size, shape or color. The artists do their best to reproduce each design as close to the photo as possible. However, we want you to know that because they are each unique creations in themselves, your piece might look slightly different. Opal Art Glass is designed and created in the studio of Johhny and Darlene Camp.